comment A great way to explore the city and get your bearings. Ideal for first time visitors. 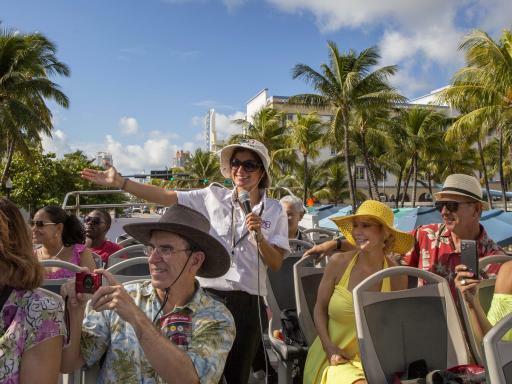 This Hop-on, Hop-off bus tour takes care of all your transport needs meaning you can simply concentrate on taking in the city's stunning array of sights including South Beach, Downtown Miami, Coral Gables, Coconut Grove, Little Havana and more. SPECIAL OFFER! From now until 3rd September 2018, book a Premium Ticket and enjoy an additional day of hop-on hop-off bus access. 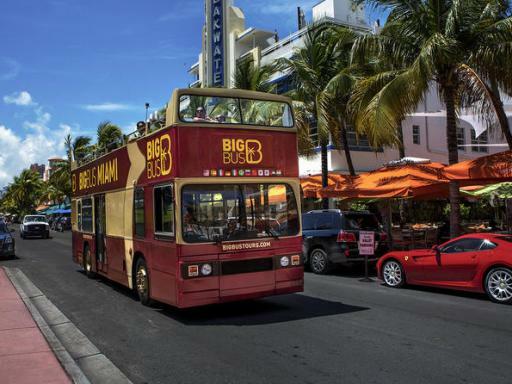 As well as showcasing the very best of Miami's many highlights, this Hop-on, Hop-off bus tour is designed to make your life as easy as possible when exploring the city. With regular departures running throughout the day, you can get on or off at any one of more than 25 stops in order to explore the places that take your interest. 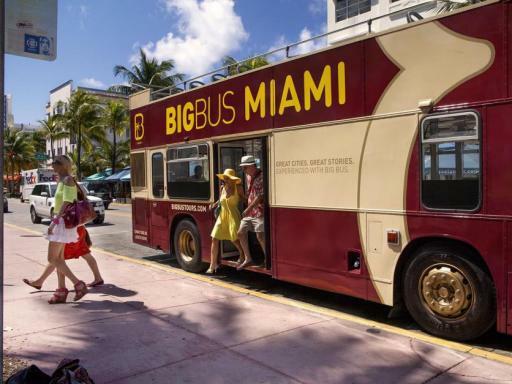 If you're short of time, the Classic bus tour is an ideal way of seeing all the districts, neighbourhoods and monuments that make Miami famous. 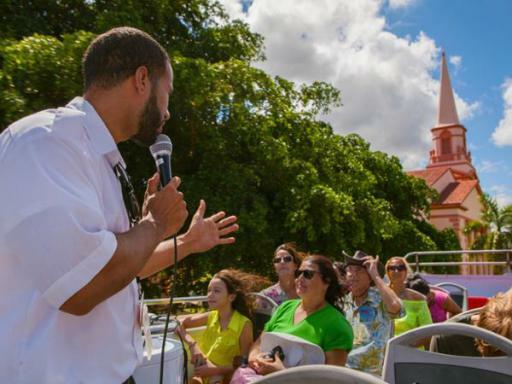 However, if you have a bit more time - enjoy the Deluxe tour, which also includes a complimentary scenice boat cruise and Little Havana walking tour, at a more leisurely pace. 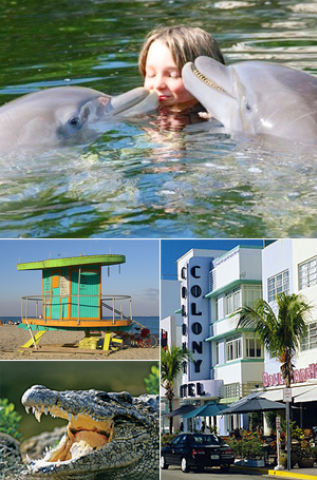 Classic: ONE-Day Hop-on, Hop-off bus tour taking you to Miami's best sights on three different routes. Plus, live guides on all City Loop and Beach Loop buses. 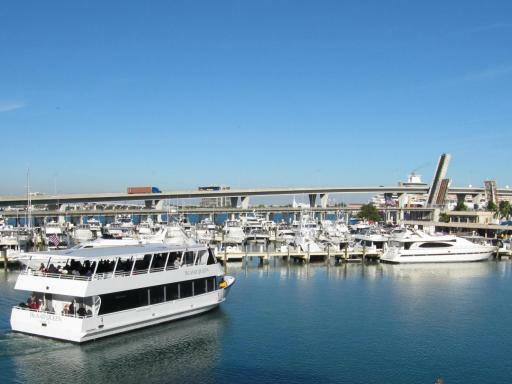 Premium: Includes the Classic tour PLUS a scenic boat cruise around Biscayne Bay. SPECIAL OFFER! From now until 3rd September 2018, book a Premium Ticket and enjoy an additional day of hop-on hop-off bus access. Deluxe: The Premium tour but with a TWO-DAY Hop-on, Hop-off ticket PLUS the Panoramic Night Tour. 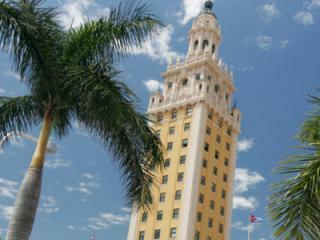 Panoramic Night Tour: Hop on this 90-minute panoramic Night Tour and see Miami sights by night. Enjoy the vibrant buzz on South Beach's Ocean Drive and discover the city's best landmarks as they're illuminated in the evening. The Beach Loop (Blue Route): Buses run every 30 minutes from 8.30am until 7.00pm and a full loop takes 1.5 hours - The Beach Loop journeys from Central Station, along the scenic Macarthur Causeway and all the way around the island of Miami Beach. Enjoy views across the islands and towards the skyline of Downtown Miami, visit Washington Avenue, Collins Avenue and Ocean Drive. Tours feature both English-speaking guides and pre-recorded commentary — available in 12 languages. Hop off at stops 1 or 2 to change to the City Loop - Red Route or the Attractions & Museums Loop - Yellow Route. 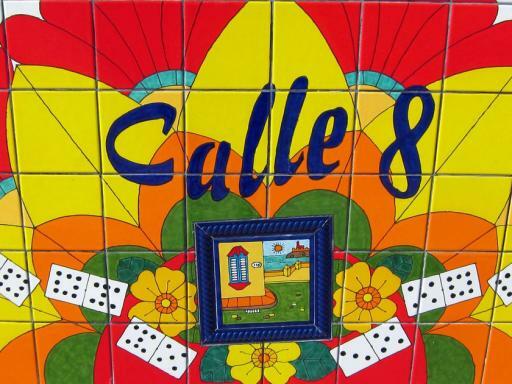 Stops: Central Station, Pérez & Frost Museums, South Beach 1, South Beach 2, Bass Museum, The Riviera, Riu Hotel, Mosaic at Miami Beach, Holiday Inn at Miami Beach, Fontainebleau Hotel, Miami Beach Resort & Spa, Holocaust Memorial, Lincoln Road, Shops at 5th & Alton, Jungle Island. The City Loop (Red Route): Buses run every 30 minutes from 9.25am until 7.00pm and a full loop takes 1.5 hours - Also departing from Central Station, the City Loop journeys through some fastinating districts of Mainland Miami such as Coconut Grove, Coral Gables and Little Havana. You will also get to see famous monuments and buildings such as Venetian Pool, the Biltmore Hotel, Freedom Tower, the County Courthouse and Vizcaya Museum. Stops: Central Station, Pérez & Frost Museums, Trinity Episcopal Cathedral, Midtown, Wynwood Walls, Miami Supercar Rooms, Lyric Theater, Vizcaya Museum & Gardens, Coconut Grove, Little Havana, Downtown Miami. Attraction & Museum Loop (Yellow Route): Buses run every two hours from 10.00am to 5.00pm and a full loop takes 1.25 hours - Discover some of Miami's most exciting attractions and museums, including the Seaquarium, Children's Museum and Jungle Island. The Attractions & Museums Loop features pre-recorded commentary in 12 languages. Stops: Central Station, Pérez & Frost Museums, Jungle Island, Vizcaya Museums & Gardens, History Mami Museum, Miami Seaquarium, Brickell, Miami Children's Museum. Departure Location: Central Station – Bayfront Park, 301 North Biscayne Boulevard, Miami, 33132. Start Times: Bus tours begin at 8:30am except the Uptown loop which commences at 9.15am. 2-Day Deluxe tickets must be used on consecutive days. You can hop on and hop off as many times as you like for the duration of your ticket. 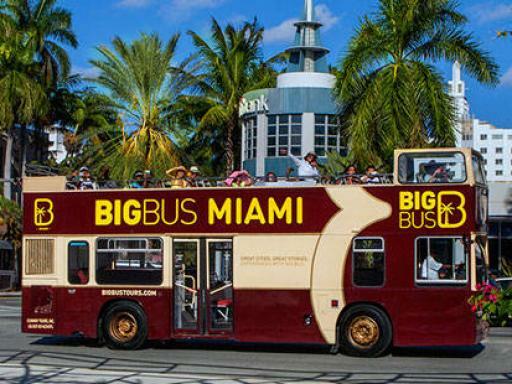 Big Bus Tours Miami operates every day of the year. A child ticket is available for children aged between 5 and 15 years. Children aged 4 years and under may travel free of charge. Children aged 15 years and under must be accompanied by an adult. With the exception of extreme weather conditions that would jeopardize safety, tours operate in all weather, rain or shine. Refunds due to weather will not be granted unless the service is suspended as a result of weather. SPECIAL OFFER! From now until 3rd September 2018, book a Premium Ticket and enjoy an additional day of hop-on hop-off bus access. This is only available on the Premium Ticket. Is there commentary available in my language? Tour buses alternate between live commentary in English and a recorded commentary in a choice of 11 languages. If the first bus you board isn't providing your preferred commentary, then the next bus along should meet your needs. Personal recorded commentary is provided in 11 languages: English, Spanish, French, German, Italian, Portuguese, Russian, Mandarin, Japanese, Arabic and Hindi. Guests aged 0-4 years may travel free of charge. Guests aged between 5 and 15 years must book a Child's ticket. Do I need to specify a day of travel when I book? No, you can activate your ticket and travel on any day. However, if you've purchased a 48-hour ticket, you must travel on consecutive days. Redeem your voucher at Central Station, Bayfront Park – 301 North Biscayne Boulevard, Miami, 33132 or at any of the stops along the tour.